In 1958 E. BUNNING published a book in the former series "Proto- plasmatologia" entitled "Polaritat und inaquale Teilung des pflanzlichen Protoplasten" (polarity and unequal division of the plant protoplast) in which for the first time results of experimental plant cytomorphogenesis were re- viewed. This book was based completely on light microscopic observations and rather simple experimental techniques. Since then our knowledge of basic cytomorphogenetic mechanisms has greatly increased, especially with the introduction of modern ultrastructural, biochemical and sophisticated experi- mental methods so that the field of cytomorphogenesis in our days should be considered a separate discipline within the general field of cell biology. 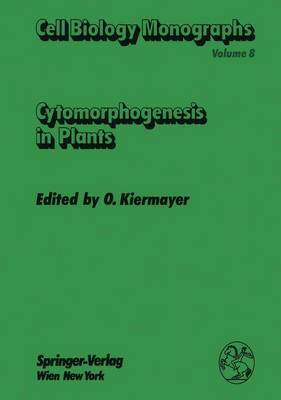 This book, "Cytomorphogenesis in Plants", represents a necessary attempt to bring together current knowledge in this field of research on a comparable basis. Unfortunately enormous gaps in our understanding of the underlying principles of cytomorphogenetic events still exist. Therefore it seemed reason- able to present a book composed of individual chapters, each written by experts for a defined experimental system. Each chapter represent a separate treatise with its own references, hence it was not possible to avoid some overlap both in the text and in the literature of the chapters without destroying the uni- formity of the respective article.